This has been kind of a busy week for dogs getting themselves into sticky situations. On Friday, a Pit Bull mix named Jimma somehow managed to get her head stuck in a tire rim. Two crews from the Indianapolis Fire Department worked for more than an hour to free her. 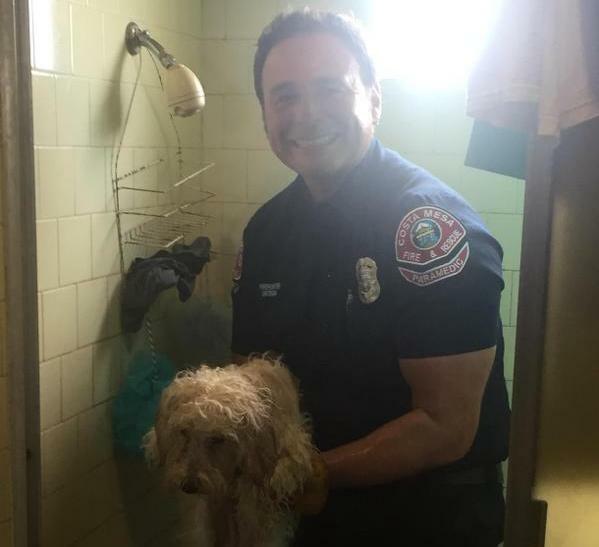 Using a sledgehammer and chisel, three crew members from the Costa Mesa Fire Department worked for 40 minutes to open the drain and safely free the dog’s paw. “The dog would bark and bite very time we tried to move it, just from pain,” Fire Capt. Nick Cerciello told the Daily Pilot. The dog was apparently okay after his ordeal, and was even able to bolt down the apartment’s stairs as the family’s kids cheered. “Didn’t have a limp or anything,” Cerciello told the Daily Pilot. Nevertheless, he advised the pet parents to have the dog checked out by a veterinarian. “Sometimes it can be a ruff job,” the Costa Mesa Fire Department noted on its Facebook page yesterday. Strangely enough, a Poodle named Morita found herself in this exact same predicament 11 months ago. 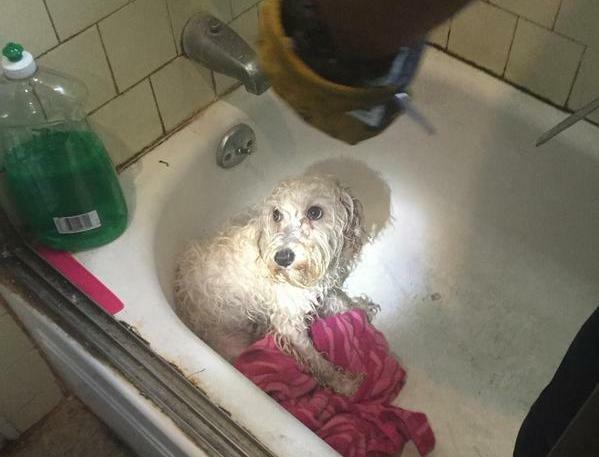 A crew from the Albuquerque Fire Department cut open the bathtub and removed the drain — with Morita’s paw still stuck inside it. She was rushed to a vet, who was able to free her. Morita wasn’t seriously injured, but suffered pain from her swollen paw. Don’t Let This Happen to Your Dog! The takeaway from both these incidents? Be sure to use a drain cover when you give your dog a bath, and remove your dog from the tub before draining the water.